At the “How Can We Bridge Gender Gaps and Increase Women and Girls Access to Technology?” Technology Salon in Washington, D.C., leaders in various fields came together to discuss data and initiatives aimed to bridge the gender gaps in technology, with lead discussants Shireen Santosham, Revi Sterling, and Elise Young. 1. It’s more than just women having technology devices. If it were as easy as giving every woman a cell phone and walking away from it all, there wouldn’t be a need for research, Tech Salons like this wouldn’t exist, and I wouldn’t be writing this blog post. 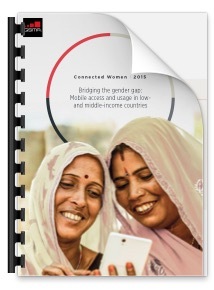 In order for mobile access to be meaningful, women have to also overcome the many barriers to meaningfully using their devices that were listed out in GSMA Connected Women 2015’s report. Trust in the mobile network ecosystem, from airtime sales agents to MNOs. Participants at the Salon discussed innovative ways women have gotten around these issues. My favorite was women using Emojis in lieu of words to convey messages, which can require a great deal of creativity. In order to make this increase in access meaningful and sustainable, global developers need to start thinking about these barriers seriously, and how to overcome them. 2. Everyone – women, men, or anyone – wants to use technology that is relevant to their interests and needs. That statement may seem like a waste of characters, but how often are the wants and needs of women explicitly prioritized, or at the very least considered, when designing mobile technology? Caveat: no one is calling for ridiculous “for her”products. Instead, at the Tech Salon, participants highlighted the importance of actually listening to women and paying attention to what they want and need. For example, many women in Jordan love using WhatsApp because they can create closed groups that are perceived as safe, and they can communicate directly with loved ones. The participants at the Tech Salon pointed out that they’ve found that women really do value mobile phones. Women feel more connected and more empowered to make good decisions. For example, leaders of female agricultural cooperatives in Latin America who use mobile phones are more aware of market prices and better able to identify pricing scams, which allow them to run their businesses more efficiently and effectively. 3. We need to pay attention to the gender gap here at home. There is undoubtedly a huge gender gap in the field of technology here in the U.S. Women in tech face discrimination and endless challenges in order to do what they are passionate about. Beyond that, convening such as this Salon, in which we bridge the professional gap between gender and technology, are uncommon. Someone pointed out that it’s often the same three or four people (usually women) in the room discussing gender issues, which is nice but could use more input from more people. The data from GSMA Connected Women 2015 pointed out that stakeholders need to focus on empowering women and working together to bridge the gap, but I would argue that this rings true for us at home too. Organizations ought to empower women who work in technology, and work together as a whole to address the gender gap in access to mobile technology around the world. As part of this Technology Salon we’ve compiled a list of resources around the topic to serve as a reference and a primer on the topic.